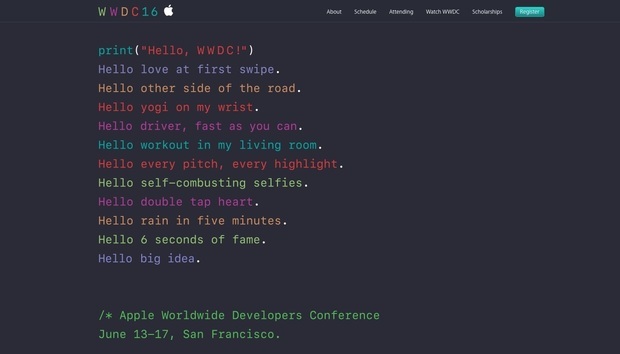 Apple yesterday set June 13-16 as the dates for this year's annual developers conference, and for the third straight year will draw tickets using a lottery. The Worldwide Developers Conference (WWDC) will open Monday, June 13, with a keynote by executives, almost certainly led by CEO Tim Cook and with a supporting cast that will probably include resident funnyman Craig Federighi, who runs the company's software engineering groups, and Philip Schiller, Apple's head marketer. WWDC will again take place in San Francisco's Moscone Center, the venue for the last 13 years. The keynote presentation will use the Bill Graham Civic Auditorium, the century-old building where Apple hosted its September 2015 iPhone rollout. As it has for the last two years, Apple will allocate WWDC tickets in a random drawing after registration closes on Friday at 10 a.m. PT. Developers who have been awarded tickets will be notified by April 25. In 2014, the lottery replaced the first-come-first-served practice, which had irked developers who missed the window of opportunity when tickets sold out in minutes. If Apple keeps to its long-established habit, it will use the WWDC keynote to publicly preview the next editions of iOS and OS X, release beta code to developers, then launch the upgrades in the fall. The last five years Apple has waited until June's WWDC to hand developers an iOS SDK (software development kit), then unveiled new iPhones in September (2012-2015) or October (2011). Apple launched the current OS X -- El Capitan -- in September 2015, but shipped the two prior editions, Mavericks and Yosemite, in October 2013 and 2014, respectively. Apple will likely rebrand OS X as MacOS at WWDC. The WWDC opening keynote is one of Apple's annual milestones, and the company has usually webcast the event. It will again this year, starting at 10 a.m. PT on June 13. Registered developers can apply for tickets on Apple's site. Tickets have again been priced at $1,599. Three hundred and fifty spots have been reserved for full- or part-time students ages 13 years old and up. To qualify for a free ticket, students must submit a native iOS, OS X, tvOS or watchOS app.